This last year sees a growing interest for physically based rendering. Physically based shading simplify parameters control for artists, allow more consistent look under different lighting condition and have better realistic look. As many game developers, I decided to introduce physical based shading model to my company. I started this blog to share what we learn. The blog post is divided in two-part. I will first present the physical shading model we chose and what we add in our engine to support it : This is the subject of this post. Then I will describe the process of making good data to feed this lighting model: Feeding a physically based shading model . I hope you will enjoy it and will share your own way of working with physically based shading model. Feedback are welcomed! Notation of this post can be found in siggraph 2010 Physically-Based Shading Models in Film and Game Production Naty Hoffman’s paper . Working with a physically based shading model imply some changes in a game engine to fully support it. I will expose here the physically based rendering (PBR) way we chosed for our game engine. When talking about PBR, we talk about BRDF, Fresnel, energy conserving, Microfacet theory, punctual light sources equation… All these concepts are very well described in  and will not be reexplained here. Our main lighting model is composed of two-part: Ambient lighting and direct lighting. But before digging into these subjects, I will talk about some magic numbers. I would like to clarify the constant we find in various lighting model. The energy conservation constraint (the outgoing energy cannot be greater than the incoming energy) requires the BRDF to be normalized. There are two different approaches to normalize a BRDF. Normalizing a BRDF means that the directional-hemispherical reflectance (the reflectance of a surface under direct illumination) must always be between 0 and 1 : . This is an integral over the hemisphere. In game corresponds to the diffuse color . Derivation of these constants can be found in  and . Another good sum up is provide in . About the approximation we chose, we were not trying to be strictly conservative (that is important for multi-bounce GI solutions to converge, but not for rasterization). We were trying to choose a cheap approximation which is close to 1, and we thought it more important to be close for low specular powers. Low specular powers have highlights that cover a lot of pixels and are unlikely to be saturating past 1. The integral is over the sphere and cosine factor is not clamped. The constant comes from the normalized Blinn NDF constant divided by 4 (the factor included in microfacet BRDF). The term has disappeard from the normalization constant. For a more PBR compliant model such as ours this is more difficult because we must take into account the Fresnel term. Just using “1 – Fresnel” is not valid. See  or  for details. We aren’t handling this in our game. Real world SpecularPower values range from 0.1 to more than 100000 . It is very difficult for game engines to deal with such a range without storing SpecularPower on 16bits instead of the usual 8bits. Obviously, we didn’t do this and try to use the 8bits available as best as possible. Most game engines store SpecularPower in the 0-255 range fitting nicely an 8bit texture. Which is rather a bad way for PBR. As in  we used a gloss factor defined in the 0(rough)-1(smooth) range and stored in 8bit. The decoding follow this equation which allows a perceptual linear distribution. Remark.With very smooth surfaces (with high SpecularPower values) like water, we can get really strong highlight. Using half in shader instead of float for specular lighting resulted in banding artifacts. So some parts of our specular calculation are using float. In game we deals with two category of material: dielectric and metal material. Dielectric material (water, glass, skin, wood, hair, leather, plastic, stone, concrete…) have white specular reflectance. Metals have spectral (mean use RGB color) specular reflectance. But some metals have same Fresnel behavior at all wavelength (like aluminium). See  or . With this in mind, it can be tempting for performance to have a separated shader for non-spectral (the most common material) and spectral specular material. This could reduce storage (require 1 channel in texture instead of 3) and save few mul/mad instruction in shader (the pow is not affected). However, a common trick to save drawcall is to merge material ID (3DS Max definition) together to have only one drawcall per object. Dieletric and metal material on an object now shared the same texture and the same shader. To deal with this advantage, we only have one spectral specular lighting shader. The instruction penalty is really low and texture storage is not a big deal either as specular tend to be constant and require low resolution texture. I must add that we have a forward engine. Deferred engine with only one channel for specular color will not deal with spectral specular. Gotanda in  used a dedicated metal lighting shader. This metal lighting model is based on  which details an “Error compensation” that creates the particular curve around Brewster’s angle with metals. According to Gotanda, this only creates a subtle difference . We didn’t consider it for our game. Edit : This section is not up to date. Read Spherical Gaussian approximation for Blinn-Phong, Phong and Fresnel for full details. We apply a similar optimization for Blinn distribution as in . The deal is just to see that for low specular power exp((p+1) * (dot(A,B) – 1)) fit nicely and for high specular power we can drop the +1. This is what  do without mentionning it. Low specular value will be wrong but nobody will notice it. Instead of using p+1 in the fresnel approximation, you can tweak the added value between 0-1 depends on what best fit what you want for your given specular power . Ambient diffuse is based on static global illuminated lightmap (containing only indirect lighting) for environment and SH irradiance volume for dynamic object. 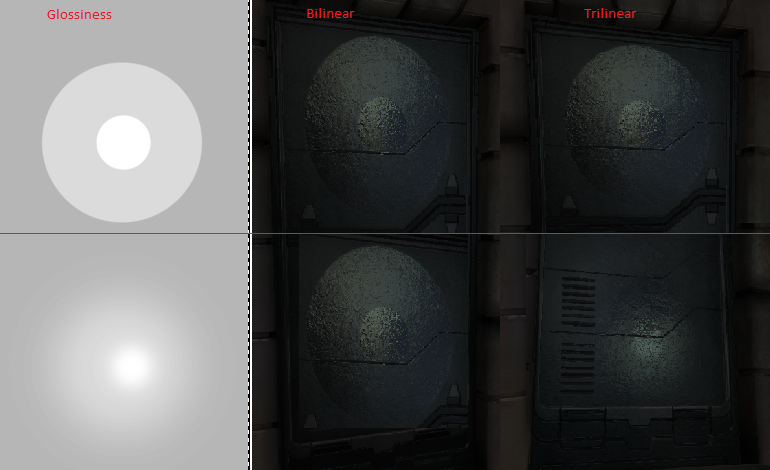 PBR is really important for global illumination solver to avoid creating lighting with multiple bounce. I will not talk about ambient diffuse. There is several good reference on it. For ambient specular we take the now common solution to apply prefiltered environment map (cube map) on everything, even “matte” object. This make sense because in real world, every object have some specular lighting . And this help to deal with metal material which should have no diffuse component. Care must be taken to ensure that highlight blurring (specular lighting coming from punctual light sources which are not present in the cubemap) is consistent with cubemap blurring (specular coming from cubemap) . Most game use an eye calibrated prefiltered cubemap. A method of eye calibration is describe in . We tried to be more “correct” for our game. and apply the Fresnel term at runtime. This mean that our ambient specular will not match our Blinn-Phong highlight. But with a single environment lookup, we are only able to match Phong highlight. AMD Cubemapgen tool (which deal with proper filtering and edge fixup)  is generally used to prefilter cubemap, but it don’t offer a cosines power weighting filter. HDRShop  can perform this kind of filtering but require a conversion to latlong environment format. We write our custom version inside our engine (Edit: The source code of AMD Cubemapgen are now available and can be found at . It is easy to add a cosines power weighting filter. The source has been uploaded to a google code project  and are subject to evolve). In shader, to recover in between blurriness, we set trilinear interpolation with clamp texture address mode for the prefiltered cubemap . With this method, we handle different cubemap resolutions without the need to eye recalibrate highlight matching. From Left to Right there is 11 spheres using our specular model. Each have a different SpecularPower (2048-1024-512-256-128-64-32-16-8-4-2). All spheres display a prefiltered cubemap and a highlight from a directional light (the white point) and no bloom postprocess is present. On the top row, as a reference, spheres use 128x128x6 prefiltered cubemap at full resolution (so no mipmap chain). On the bottom row, spheres use 128x128x6 prefiltered cubemap with mipmap chain generated with the detailed method. See how the highlight blurring is consistent with the cubemap blurring and how the mipmap chain approximation is close to the reference solution for SpecularPower > 32. Below the resolution of mipmap start to be a problem but result quality is sufficient for us. – We used HDR cubemap of 128x128x6 with mip level going until 4×4 (Remember that our blurring is based on number of mipmap) compress and convert to sRGB similar to  then transformed in DXT1. – As we use cosines power prefiltering, even a SpecularPower of 2048 still blur the cubemap. Perfect cubemap can be get only with a SpecularPower > 16000. To solve this, we add an option for artists to “bias” the specular power range when generating prefiltered cubemap and apply a SpecularPower remapping to still consistent. – If you tell me “Is this work really required ?”, I will say “probably not”. You can get good result with standard eye matching. Flexibility in cubemap size still a good point and if you can afford 16bit SpecularPower and higher cubemap resolution, it could be a good solution. Each sphere is parameterized with our specular model (ambient specular + direct specular). Non spectral (grey) specular value increase from left (0) to right (1). Gloss value increase from top (0 – rough) to bottom (1 – smooth). Applying Fresnel term to prefiltered cubemap has a bad effect of always showing high specular color at edge, even for rough surface. The same Fresnel term which is appropriate for unfiltered environment maps (i.e. perfectly smooth mirror surfaces) is not appropriate for filtered environment maps since there you are averaging incoming light colors from many directions, but using a single Fresnel value computed for the reflection direction. The correct function has similar values as the regular Fresnel expression at v=n, but at glancing angle it behaves differently. In particular, the lerp(from base specular to white) does not go all the way to white at glancing angles in the case of rough surfaces . Illustration of the above formula. Top-Left zoom of the last spheres screenshot. Spheres have low specular and low gloss value. See how the fresnel effect is visible on the left image and have annoying edge highlight. Lazarov in  handle the Fresnel attenuation with a modified Fresnel equation : . According to the slide comment, his factor needs more tuning and the current approximation is a bit too bright, especially for rough surfaces. Caution, the equation is done to match the Fresnel and visibility term used by Dimitar Lazarov, if you don’t use the same visibility term, you must find a new equation. Another approach to handle this fresnel behavior is describe in . The paper define a custom ambient BRDF with one part of the specular BRDF baked into a volume texture and the other part in the prefiltered cubemap. hardware selected mip. The mip use will be max of hardware selected mip and gloss selected mip. Another way to reduce texture trashing is to apply a gloss texture filtering as describe in  or . The next step after adopting a PBR is using it in production. See Feeding a physically based shading model. Personal communication with Yoshiharu Gotanda tri-Ace, Inc.
I’d be interested in seeing some stats showing if humans can actually see the difference in-game. Taking the same gameplay moments, are users able to see a difference with and without pbr ? And what is the actual improvement factor… The technique seems interesting, but before adopting it I’d like to know how much it will improve the end result. What change did you have to make to your pipeline for artists to be able to edit in that range ? Thanks for sharing this info ! It’s always interesting to see what others do and how they do it . It is important to understand that adopting a physically based shading model is only useful if your art direction is realistic. To my mind, the best improvement is for artists. Parameters are simpler and better match real values. I will talk about this in my second post “Feeding a physically based shading model”. As you will read, the quality of the physically based shading model highly depend on your artists work. Once artists are trained, I am sure you will see the difference. Lighting should be carefully calibrated too. I can’t provide screenshots for now. But when my company will publish them, I will link to them. The main drawback in our pipeline is to train artists. I think my second post will answers your questions. I’m a bit worried about your handling of the diffuse term when combining specular and diffuse lighting. You say ‘Just using “1 – Fresnel” is not valid.’, which is true but not the whole story. And the part of the story that you are missing is that “1 – Fresnel” is a better approximation than using 1, or the “normal reflectance” factor. If you draw out the geometry of what is happening, “1 – Fresnel” is the transmitted light through the top layer, so this is a good factor for scaling any reflection happening beneath the top layer. The reason this is “not valid” is because the light should be attenuated by a second Fresnel term when leaving the surface as it goes through the translucent layer again. where iFresnel and oFresnel are the incoming and outgoing Fresnel terms. I don’t see much of a problem with leaving off the second Fresnel attenuation (oFresnel) as an approximation, leaving you with “1-iFresnel” to attenuate the diffuse, which is certainly going to be closer to what you want than what you propose to use. Just because “1-Fresnel” is not 100% correct doesn’t mean that it’s not a lot closer to correct than just using 1. Or simply said, it should be reciprocal. 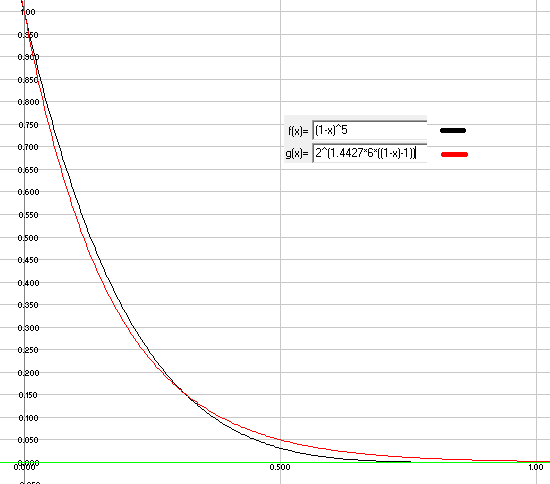 And agree, 1- F is better than nothing..
BTW, Gotanda from Tri-Ace is using a simpler approximation (1 – F0). When I say ” We didn’t use it in our game”, I should have precise that at the time of Remember Me, I have try to add this term during the production, and this was changing the visual too much (due to some bar art content). So I have revert the change. So I haven’t use it because it was not valid, but because it was introduce too late in the production. I think I was confused by the microfacet model that uses the half angle vector as the normal, this makes the Fresnel term view dependent, and if you use 1-F for the diffuse term, then the diffuse term becomes view dependent, which it shouldn’t be. So, since people are using the microfacet normal for the specular Fresnel term, and they don’t want diffuse to be view dependent, there should be an equation for the microfacet transmission Fresnel term, which they approximate using 1-F0. Maybe it would be easier and look better just to use the macro surface normal for the specular Fresnel term and the reciprocal for diffuse. What do you mean by saying “Blinn” and “Blinn BRDF” for example, what each of those represents, what’s the difference? Blinn BRDF mean the empirical Blinn formula multiply by cos(N, L). The formula of a BRDF is int( f() * cos(N, L) ) . In this case, Blinn term is just f(). We have BRDF = F(…) * G(…) * D(h) / (…). So when people talk about normalizing the BRDF they talk about normalizing the NDF. only. Or am i missin something ? When people in game industry talk about normalizing the BRDF they indeed often talk about normalizing the NDF only. However the NDF is only a part of the BRDF equation. For a BRDF to be really physically based it must pass the weak furnace test as describe by Eric Heitz in this paper: http://jcgt.org/published/0003/02/03/. In this context the geometric term is also part of the normalization. But to be fair at the time I write this post this paper was not out and I was certainly thinking to something a bit different, just I forget about it :). Oh the geometric term is also part of the normalization.